The above info came from Aisu-Kitsune, and was edited by yours truly (contact me). The image came from img.photobucket.com. Hatsuki Azuma, a Japanese highschool student, has an deep connection with her adopted sister Hatsumi. Hatsumi cannot speak but both of them have a strong bond. Finally, Hatsuki realizes that she's in love with Hatsumi but is too afraid of rejection to tell her so. What Hatsuki doesn't know is that Hatsumi is really Eve, an immortal being, and on her 16th birthday she mysteriously disappears. A little bird named Ken-chan comes looking for Eve but he's to late and finds Hatsuki instead. Ken-chan takes Hatsuki to the Great Library, a place beyond time or space, which has books containing every world/universe in existence. The keeper of this library is Eve's sister, Lilith, who is also looking for Eve. 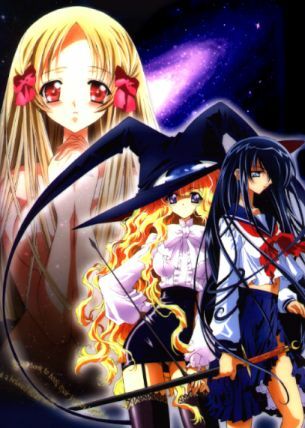 Because Hatsuki is willing to do anything to find Hatsumi, she agrees to go with Lilith and Ken-chan on a journey through the books to find her. The above description came from Aisu-Kitsune, and was edited by yours truly (contact me).